The 74F174 has six edge-triggered D-type Flip-Flops with individual D inputs and Q outputs. The common buffered Clock (CP) and Master Reset (MR) inputs load and reset (clear) all Flip-Flops simultaneously.The Register is fully edge-triggered. The state of each D input, one setup time before the Low-to-High Clock transition is transferred to the corresponding Flip-Flop s Q output.All Q outputs will be forced Low independent of Clock or Data inputs by a Low voltage level on the MR input. The device is useful for applications where true outputs only are required, and the Clock and Master Reset are common to all storage elements. This is one package pinout of 74F174,If you need more pinouts please download 74F174's pdf datasheet. 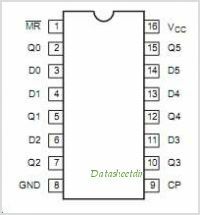 74F174 circuits will be updated soon..., now you can download the pdf datasheet to check the circuits!